These last three closure types all have one thing in common: they are devices that you purchase separately and you use when the cloth diaper doesn’t itself have hook-and-loop or snap closures. For example, prefolds and flats are good candidates for snappis, boingos and pins. The snappi has plastic teeth on each end of the Y. The goal with the snappi is to grip the teeth on either side of the cloth diaper as well as at the bottom of the Y. You need to stretch the Snappi a bit while you’re getting the teeth to grip the diaper’s fabric. This create a tension fit that holds the diaper together. Snappis need to be primed—that is, they need to be stretched out a bit beforehand so that they’re stretchy enough. They come in 2 sizes and wearing the wrong size will diminish the tension hold, so for best results, use the correct size. What is a Boingo and how is it different from a Snappi? They too have plastic teeth that work using a tension fit. You can use 1 or 2 on a single diaper. If you use 1, you attach one wing to the other wing. If you use 2, you attach each wing separately to the front of the diaper. The 2-Boingos approach creates a more secure fit. Safety pins have been used for centuries (or at the very least one century). The ones for cloth diapers have a plastic hood over the part where you do up the pin that makes them much harder to unfasten accidentally. You’ll need two safety pins, one on either side, although 1 pin can be used in a pinch to attach one wing to the other, provided the diaper is big enough. Why would I use Snappis, Boingos or safety pins? You would use these devices if you’re using flat or prefold cloth diapers and you want to contain messes inside the diaper cover. If you just leave the cloth diapers loose inside a cover, the mess tends to get on the cover easily and may even leak out. As well, a Snappi-ed, Boingo-ed or pinned diaper is much trimmer under the cover that a folded loose diaper. You can even let your baby scoot around in just the diaper (sans cover) if you’re brave (although we would only recommend doing this with pins which are really hard to remove). So what are the pros and cons of Snappis vs. Boingos vs. safety pins? They allow you to fasten prefolds and flats, which are economical cloth diaper choices. They are fast to put on a squirmy baby. You only need 1 to fasten the whole diaper. They include a safety feature that enables you to tuck in the sharp teeth while it’s not in use. They can be added with one hand and are easier to put on than pins. They are good for arthritic hands. The teeth are sharper than Boingo’s and can prick parents. Sometimes the elastic is not stretchy enough and it’s tough to get them on. The teeth sometimes don’t catch properly on tighter weaved material like flannel. Using the wrong size will cause the Snappi to come off if it’s not pulled tight enough. Pulling the snappi too tight can bother some babies. The bottom of the ‘Y’ of the snappi sometimes doesn’t catch. Sometimes, with active babies, the front of the diaper falls down under the snappi. Because the Snappi is a single device, you might not get both sides attached perfectly and you might need to readjust a few times to get a snug fit. If the bottom of the ‘y’ is bothersome, you can cut it off. If you find the Snappi is too stiff, you can ‘prime’ it by stretching it out a bit before use. If you find the Snappi is not fitting across your baby’s belly, you can try the toddler size which offers a better fit on many babies. They have many of the same pros as Snappis, so look over that section. If you’re using 2, you can do one side of the cloth diaper at a time, which might give you a better fit, especially if your baby is squirmy. They’re versatile: You can use 1 or 2 of them depending on your needs. Smaller babies can use 1 if there is not enough room at the front for 2. If you need 2 and you’ve lost one, you’re out of luck. 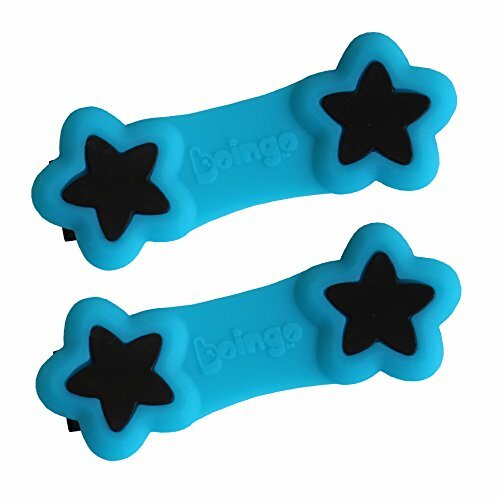 If you do use a single one to attach both wings to each other, the front might slip down under the Boingo (Snappi can have the same problem). Solid fit that won’t come undone on active babies. 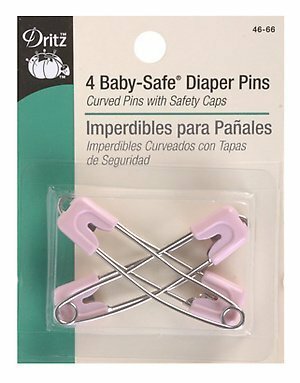 Because they’re hard to take off, safety pins are the only recommended fastener if you want to let your baby go cover-free. It takes practice to get the hang of attaching them. It might be difficult to get past the fear of pricking your baby or yourself. At this point, you have learned about all the cloth diaper fastener types: hook-and-loop, snaps, Snappis, Boingos and safety pins. In the next and final post, we'll announce the winner of The Best Closure Type Award.